Nowadays in a digital world, one thing you need is to have many passwords for different purposes. Google Chrome’s in-built password manager will help you to store all your login information for many websites. Without Chrome password management feature, you will need to remember them in memory. However, letting Chrome to completely handle your passwords may not be an ideal solution as well. In this article let us check out why you need dedicated password management tools and 5 Chrome extensions for password management. Why You Need Password Management Tool? Chrome password management isn’t completely secure. It is easy for anyone having admin access to your computer can get the full access of your passwords stored in Chrome browser. You need to have a solid management policy for your password and avoid leaving your credential easily accessible to others. Dedicated password management tool uses two factor authentication to protect your passwords. As an example, a random one time passcode is sent to your smartphone or you need to answer challenge questions before accessing passwords. Chrome does not offer any smart detection of unusual activities or two factor authentication. Although the built-in password manager for Chrome is quite useful, it still can’t compete with real password management extensions. Here are a few extensions that you may consider to use. Remember, all password management extensions need you to register an account with the developer site. Lastpass is an ultimate password manager for Chrome browser. Although you can use all features for free in Chrome extension, you can separately use premium app on your device for $2 per user or $4 per family of 6 users. Lastpass is a cloud-based password extension for Chrome and other web browsers. It is also available as mobile apps and desktop PC programs. Has a powerful mechanism and requires various two-factor authentications to prevent unauthorized individuals from breaking into your password vault. Your login information is encrypted and stored on Lastpass servers. The extension for your browser will encrypt and decrypt passwords as needed, so even people in Lastpass can’t see your passwords. 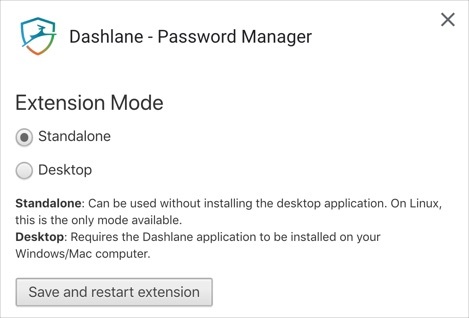 Dashlane is a Chrome extensions you can securely manage all website’s password in one place. The developer claims that more than 8 million users are using Dashlane. Below are some of the features of Dashlane – Password Manager. It encrypts and stores your password. You can generate random passwords that will be difficult to break. Effective and easy to use interface, so you can access passwords easily on any platform. If you decide to make your own password, Dashlane will analyze its strength. You can choose to keep all login information locally, instead of in cloud storage, to improve security. Your information is AES-encrypted, so even if hackers manage to intercept your data, it will take too much effort to break, especially if you change passwords regularly. You can work with the standalone extension or install desktop app. The free version supports up to 50 password storage on a single device. You need to upgrade the extension to premium to sync passwords on multiple devices, get premium support and VPN. The premium version will cost you $4.99 or $9.99 per month based on the features. RoboForm Password Manager helps to store all Chrome password in one place similar to other extensions. One click login to websites using stored passwords. The extension will automatically store the password for new websites. Supports multi-step logins using “Matching Logins” feature. 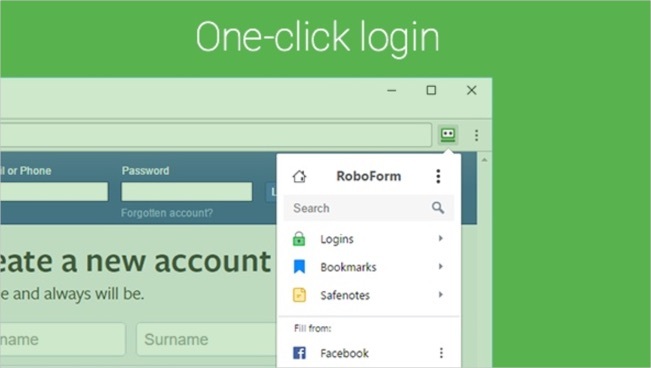 You can save passwords to RoboForm account. Has built-in password generator to create strong passwords. You can either use the extension in standalone mode or combine with installing a desktop app. KeePass is a free and open source password manager for all your needs. This is a Windows based app also available for USB device which you can without the installation . KeePass stores all your passwords in a local database and you need extensions like CKP – KeePass Integration for Chrome to retrieve the password from KeyPass database to Chrome. This is suitable for people who are not comfortable of storing passwords in the cloud. You can export passwords to a file in text, CSV. XML or HTML format. It also allows to import passwords from other password manager apps. Easily transfer the master password database from one computer to another. KeePass Stores login information locally on your computer, so it’s totally under your control. One problem with this, you need to be fully responsible with your password. If your laptop is stolen, it’s possible for people to have complete access to your accounts. You will also need to manually sync between your devices. 1Password is a Chrome extension to manage the desktop app. You can install the desktop app on Windows or Mac and use this extension on Chrome to retrieve the stored passwords. Allows to use tags so that you can quickly search and find the passwords. Easily create password and fill credit card details. Option to remove sensitive data. You can login to allowed apps using single tap. There is big list of allowed apps including Tumblr and Twitter. The premium version offers more features and will cost $2.99 per month for single user and $4.99 per month for a family of 5 users. If you have to store few passwords only on Chrome browser then you can simply rely on the built-in password manager. However, if you have many passwords, credit card details and auto form filling features then try one of the above mentioned desktop apps. You can install Chrome extension for the app and retrieve the password for logging into your website in single click.